The sun began rising in the sky over Skyrim as the clouds disappeared through the night. As the sun rose, the day began to slowly become warmer, and the town of Falkreath started to come alive again. Inside his room in the Dead Man’s Drink in, Avingard remained asleep in his rented bed. He hadn’t stirred since he collapsed down onto the bed. Suddenly, he felt a jolt of pain run through his arm, waking him instantly. He clung to his arm and grimaced in pain. The wound he suffered from the Orc’s dagger was causing him problems this morning. He then remembered that he had two minor healing potions in his possession, but was hoping to save them until he was more badly wounded. The pain was growing more intense, so he scurried through his belongings and took out one of the potions. Opening he bottle he drunk the entire potion. Almost immediately he began to feel better and sat back on the bed. He rose to his feet and strapped on the iron armor he had obtained from the Orc and sheathed his iron sword. After checking to ensure he had all his belongings, he opened the door to his room and walked back into the main room of the inn. Valga was busy behind the counter, but gave Avingard a quick smile before resuming her work. He sat down at the nearest table and ate some breakfast, which comprised of bread and apples that he found within the fort the previous day. Avingard stood up, and without saying a word, left the tavern. After the cloudy day he experienced yesterday, Avingard was glad to feel the warm son on his face. Looking around he noticed that Lod was busy talking to someone, so Avingard didn’t want to disturb him just yet. He, instead, walked across the way to the local general goods shop – Gray Pine Goods. Gray Pine Goods was a small store, and pretty much sold many different varieties of items. The store had a few storage containers, such as sacks, urns, chests, throughout the shop. To the right was the sales counter, which the proprietor stood behind eyeing Avingard. Behind the counter were a few shelves, which were mostly empty. 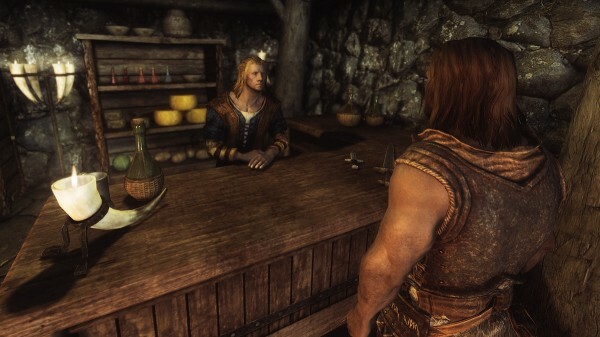 “You are a Stormcloak?” Avingard asked. Not wanting to get into any time of scuffle, especially if Solaf knows how to fight, Avingard quickly changed the subject to that of selling some of the items he found at the fort. Avingard started to show Solaf some of the items, and Solaf was more than happy to buy them all. Some items, such as the armor he had found but wasn’t wearing, Avingard saved so he could sell them to Lod. He also kept the shards he found on the pedestal hidden from Solaf as he didn’t know what he really had in his possession. “No, thank you,” Avingard replied knowing that the money he just received would go a long way in helping him on his journey. Avingard turned around and walked out of the shop and down the street a little to Lod’s forge. Lod had completed his conversation and was now back at work crafting steel armor. He stopped when he noticed Avingard coming up to see him. “Let me have a look,” Lod replied seeming interested in what Avingard had retrieved from the Orcs. Avingard showed Lod all the armor and weapons that he hadn’t sold to Solaf in the general store. To Lod’s surprise Avingard also sold his iron sold, as well. “Won’t you be needing this?” Lod asked. “I have used two-handed swords in the past, and I would feel more comfortable using one again,” Avingard replied. Lod showed Avingard the two-handed swords in his inventory and Avingard proceeded to buy a steel greatsword. Avingard pulled out the dagger shards and placed them on Lod’s workbench. Lod’s eyes widened as he saw the shards. 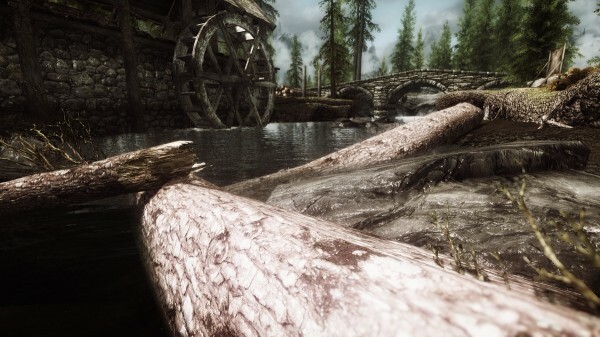 “The Shards of Mehrunes’ Razor!” Lod exclaimed. “Mehrunes’ Razor?” Avingard asked seeming puzzled by the shards. “I think I’ll just keep the shards for now,” Avingard replied not seeming interested in completing a quest for the Daedric Prince of Destruction. Avingard thought it over for a minute. Whiterun was to the northeast of Falkreath, and a little out of his way. He also knew that Whiterun was a fairly large city where he would be able to find all the supplies he would need before journeying to Solitude. He decided it was best to make the stop, then be left without the necessary supplies before heading north. “I’ll make my way over to Whiterun and then head for Solitude,” Avingard agreed. Avingard smiled and removed his armor for Lod to repair. As Lod repaired Avingard’s armor, Avingard went over to the tanning rack and made a packed bed roll with 2 deer hides he had found in the Cracked Tusk Keep. He had seen his father create bed rolls in the past, and had also created some many years ago to help his father. Avingard figured the bed roll will come in handy for the journey he is about to take.